Sayang d’Amour is a veritable palace, and can’t fail to please. If you like opulence and grandeur, the colour purple, intricate detailing, Moorish arches, palatial bedrooms, indulgent bathing facilities, an astounding collection of objets d’art, a stellar kitchen, discreet staff, and plenty of activities and games for the kids, all just a short walk from the beach and Bali’s best restaurants, then perhaps you should stop your villa search and push “book Villa Sayang d’Amour” right now. It took us ages to tour the villa simply because there is so much visual distraction (in the best possible way). Curiosity forced us to take the long and lingering roundabout route through the main house via the kitchen, living and dining room, and office/TV room, taking in all the detailing, the furnishings and décor (including hundreds of Moroccan-styled floor tiles) before we even reached the garden. 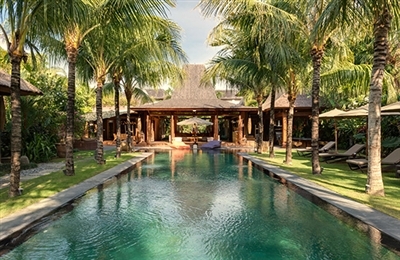 Eighty percent of the materials, furnishings and artefacts have been imported from Morocco by the French owners to recreate a private fantasy surrounded by high walls, so while it may be true that the villa doesn’t have much of a connection with Bali, it’s fun to fantasise! And although there is a chef on hand to work magic in that gourmet kitchen, being positioned in Petitenget means that some of the best restaurants in (dare we say) Asia are literally within easy walking distance. Having the super stylish W Retreat and Potato Head Beachclub as neighbours gives you the (again walking distance) choice to hang out with the movers and shakers and catch the beachclub vibe – should the privacy of your palace prove too much. At the time of our visit (June 2013) the villa was still very new and the staff not quite up to the slick standard that you might expect from a property of this calibre. But it is early days, and from what we saw we expect they will achieve service of the highest level before too long. Just across the road from the prestigious resorts of The Oberoi, The Legian and The Samaya, and a brief, worse-for-wear stagger home from Bali’s best nightspots, we found Jajaliluna’s location to be superb. The beach is almost on the doorstep while restaurants, fashion boutiques and high-end retail shops are within such easy reach that our credit card companies were loving us for it. Despite being in the middle of all this downtown action, Villa Jajaliluna is a serene and quiet oasis. We spent a very nice few hours by the pool, catching up on our magazine reading from the villa’s (very) updated selection of GQ, FRV, Vogue and The Sunday Times Travel magazines. After spending the latter part of the afternoon on the beach and enjoying a sundowner or three at Ku Dé Ta, we retired to the villa, ordered home delivery of gourmet burgers from the restaurant next door, cranked up the air-conditioning and settled down for a night of cinematic heaven on the big flat-screen in the TV lounge. Tarrantino never looked so good! We came back to Jajaliluna at the end of 2012 to find that a brand new state of the art kitchen had been added on to the side of the dining room, something which is guaranteed to make this already hyper family-friendly villa even more popular. I’m moving in! Put it another way, I don’t want to leave Villa Adasa, ever. Within moments of our arrival, the sounds of the gamelan gave way to early Dylan rasping from the Sonos sound system. How did they KNOW he’s this reviewer’s all-time favourite? Mind-reading was clearly second nature for Villa Adasa’s staff, who seemed to know what we wanted before we did, but were just as adept at giving us complete privacy when that was called for too. 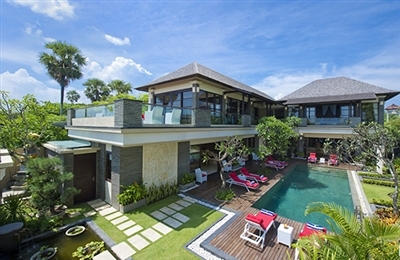 While this is a great villa for a family as well as for friends/couples sharing, Villa Adasa manages to achieve a rare intimacy that would make it equally appealing to a couple looking to splurge on space. 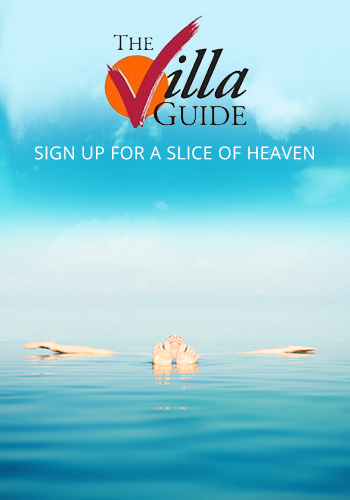 Villa Adasa delights 24/7. Daytime, we were faced with the taxing decision of whether to dive into an ocean of colourful cushions carpeting the double bale (gazebo), relax on the loungers by the pool, strip to bare essentials on the sun-deck above, or remain supine on the myriad sofas in the living pavilion. At sundown it was no contest; the best place to soak up Bali’s famous purple-hued sunset was from the loveseat on the master bedroom loggia. The night-time atmosphere at Villa Adasa is charming, thanks to its clever ambient lighting and comfortable living area. So dining presented us with an equally weighty dilemma: Do we select from the excellent menu and have our accomplished villa chef whip up a five-course meal or seafood barbecue for us, or do we wander out and take our pick from the many world-class restaurants within moments of the villa? 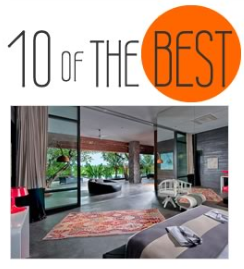 We loved hanging out in the huge master bedroom suite and enjoyed the best night’s sleep thanks to a fabulously comfy bed, luxury goose-down duvet and pillows and high thread-count cotton sateen bed linen. The Sonos music system was swish, and being able to control it from our phone and laptop was pretty cool. And it was heaven having such a wonderful library of coffee table books and glossy magazines to browse. All in all, staying here was like breathing pure oxygen — I was on a permanent health-inducing ‘high’ throughout our all-too-short-stay. We loved Villa Atas Ombak. It’s big – nay grand – and majestic with a location that just can’t be found for love nor money these days. On arrival, we had to pinch ourselves to make sure we weren’t dreaming. This is the kind of place where you really come to relax and do nothing. And when we say ‘do nothing’ we mean just that, especially with the beach being on the front doorstep. 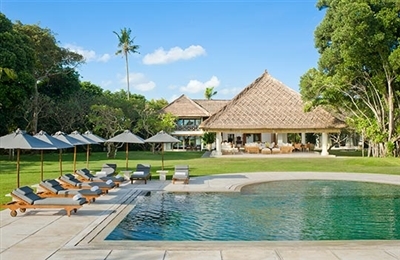 In the competitive world of luxury rental villas, it is often the staff that really makes a difference, and at Villa Atas Ombak they are definitely ‘on the ball’. Before we even knew we were thirsty, the housekeeper was strolling out to the lawn to see what we wanted to drink. Should you feel like exploring beyond the villa grounds (and believe us, you may not!) there is a handful of local restaurants just a few hundred metres up the beach which make for an unpretentious, casual lunch or sunset drinks – so casual you don’t even need to change out of your swimmers. We didn’t! For guests who like to jog or amble along the sand, the distance to Kuta is a good challenge (with a taxi back of course). Returning to Villa LeGa recently, almost everything was the same as it was the last time. And by that we mean, fantastic! The staff remembered us from our last visit and it felt a bit like coming home. There is a new beach club and restaurant next door now, but the noise was not really noticeable. On the few occasions when they have a special events going on, we suspect that villa guests will probably be dancing along with the best of them! 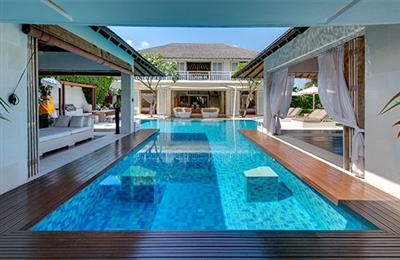 And as they offer a permanent discount to villa guests, it’s a win–win situation. The villa now boasts a new rooftop deck right at the front of the property, with sun loungers and umbrellas that look straight out to sea. All very Ibiza and la de dah. We love it! LeGa is not only a stunning property, but it boasts a fabulous location and comes with an excellent staff team who were very good at anticipating our needs before we had even knew them ourselves. There is a good menu too with an excellent choice of western fusion cuisine. Whilst the interiors of LeGa are stylish and beautifully arranged, the property still feels very homely. The ground floor living areas spill onto the swimming pool terrace and, as such, are very sociable, as is the whole villa; it feels fun, young and sophisticated. My favourite spot was the upper-floor terrace with its great views over the beach and sea. It’s a fab venue for cocktails at sunset. The villa might not have a lot of outside space, but what there is works well and the gardens are meticulously maintained; wander beyond the villa and you have the whole beach to explore. Casa Brio was a delightful surprise — everything was so much bigger and better than we anticipated; the photos really don’t do it justice. We were particularly impressed with manager Pak Yusa and his staff, who made sure we wanted for nothing during our stay from the moment they welcomed us with an ice-cold towel and fresh juice. A special shout out to Wayan the villa chef whose culinary skills ensured we never dined out (even though our old-time favourite, La Lucciola was only a five-minute stroll away). My taste buds still tingle at the thought of his delicately flavoured pomelo and chicken salad, and beautifully presented mahi mahi steaks. This feels very much like a ‘grown up’ villa — we can easily imagine elegant dinner parties and special family celebrations, and think it’s a great villa for friends to share. Families with toddlers might be concerned about the open staircase and rooftop terrace (not to mention sticky fingers all over the handsome upholstered furniture). But the staff enjoy welcoming children, can supply a pool fence on request, and there’s a large shallow pool area for young ones to enjoy.